Violet Aura discusses aura and crystal healing as a returning guest on the Curious Times Talk Radio show. 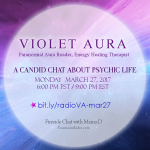 In this program, she speaks about her experience with aura reading and crystal healing for the mind, body and spirit. 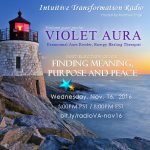 Listen in to get the information about this enlightening and empowering healing art. 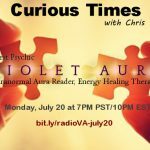 Violet Aura discusses paranormal aura reading as a first-time guest on the Curious Times Talk Radio show. 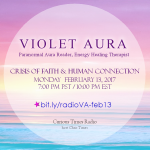 In this program, she speaks about her experience with the colors of light seen in the human aura and conducts spiritual aura readings for the listeners of the show. 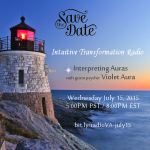 Violet Aura will discuss paranormal aura reading as a first-time guest on the Intuitive Transformation Radio show. 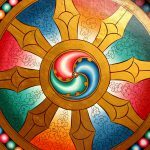 In this program, she will speak about her experience with the colors of light seen in the human aura and may conduct spiritual aura readings for listeners of the show. 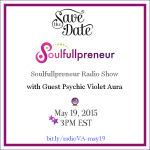 Violet Aura discusses paranormal aura reading as a first-time guest on the Soulfullpreneur Talk Radio show. 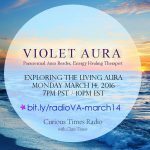 In this program, she speaks about her experience with the colors of light seen in the human aura and conducts spiritual aura readings for the hosts and listeners of the show.